As George Washington women’s basketball seniors Mei-Lyn Bautista and Kelsi Mahoney sat in La Salle’s visiting locker room last season, the two had a feeling that the team was beginning to click and that the season could be something special. Two months later that vision was realized as GW won the Atlantic 10 Women’s Basketball Championship and as conference play continues in the 2018-19 season, those positive feelings are beginning to return, though work still needs to be done. In its two most recent games, GW has handed VCU its lone conference loss and then a few days later had a 24 point lead against preseason conference favorite Duquesne late in the third quarter and held on to win the game by one point. Rizzotti understood going into this season that GW lost a lot of productivity with its group of departing seniors, Brianna Cummings, Taylor Campbell, Kelli Prange and Camila Tapias, all of whom saw important minutes and played roles in an NCAA Tournament season. Coming into the season, it was clear that the team has bought into Rizzotti’s vision, something which did not happen overnight. Given GW had a group of established seniors and the aforementioned class was in its junior season, Rizzotti admitted that at times she held back as this team had become familiar with success and what it took to win. Last season, that changed and it was clear that coming into this season, the players were just as, if not more committed. With a lot of production lost and just five players from last season’s team returning, the biggest concern has been putting the ball in the basket. Something which does drive GW is the fact that it has yet to play a 40-minute game. 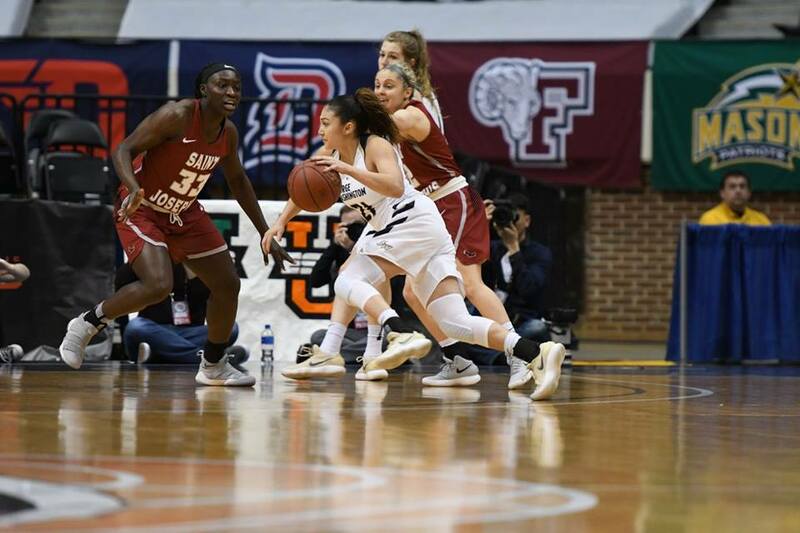 Duquesne was an effort in which the team was close but a 25-9 fourth quarter went in the opposite direction and George Washington had to fight to keep its lead. One thing GW is still working on is experience, especially when it comes to players taking on larger roles this season. A couple of years ago at Duquesne, GW won a 75-40 game in which a group containing four senior starters was able to play with a big lead. This group was unable to hold the lead and lost some of its offensive composure. Towards game’s end, GW split free throws, making enough down the stretch to come away with a win. For the second consecutive year, George Washington has three seniors on the team with this season it being Bautista, Mahoney and Anna Savino. Mahoney may have had the biggest jump both in confidence and play last season but her reputation from those outside of the team was that she was able to make three-point baskets. Last season, Mahoney made the Atlantic 10 Women’s Basketball All-Championship team not just for her threes but for timely charges, helping run the offense and her leadership. Sunday against Duquesne, Mahoney did match a career-high with five three-point baskets but also set a career-high with her five blocks. Even being assessed an unsportsmanlike after a recording one of those five blocks, GW knows it can count on Mahoney. Savino joined the team this season as a walkon after previously serving as a team manager but has now earned not only a full scholarship but a starting role, one which she has held since the Nov. 18 game against Iona. Bautista has always been a leader when wearing the buff and blue and this past week was named Atlantic 10 Women’s Basketball Player of the Week. Bautista’s leadership was again put to the test Sunday and she responded, matching her career-high of six three-point baskets set earlier in the week against VCU. Even though she turned the ball over down the stretch of that game, her leadership was noticeable whether on the court or bench. Last year, Bautista and Mahoney had to play just about flawlessly in order for GW to achieve its goals and this year, that has not changed. George Washington is currently tied for third and have played two consecutive teams ranked at the top of the conference standings. Thursday’s noon tilt with Davidson comes against a Wildcats team in solo second place. Yes, it has been a transition year and plenty of work still needs to be done, but still a third place result right now shows that there are many good signs. Defensively, GW has been very disruptive with Neila Luma’s presence providing great effort on that side of the ball, while also serving as the team’s leading scorer. Rizzotti’s current task is making sure her players understand that the roles they currently are in are what is expected of them and that in order to excel that these expectations need to be met if not exceeded. With a challenging non-conference schedule completed and momentum trending upwards, GW knows it will not catch opposing teams off guard. As a program GW has built a reputation of success and being the defending conference champion, Bautista expects each team to give its best effort. “A lot of teams want to come in and take that title but as a team we will always fight back,” she said.